My PhD is in machine learning. Politics is my hobby. Civis Analytics is a politically-connected machine learning tech-startup. I was very excited to work there. After an awkward conversation with a friend and colleague, I came to find out I was being paid 20% less than the PhD physicist that I had to train in machine learning. Civis is a machine learning startup. Civis is not SpaceX. When we discussed our salaries, he apologized to me and said I should be senior to him. Were his 9 years of doing academic research in a tangentially-related field 25% more valuable than my 8 years of research in the relevant field? There was another physicist with some machine learning knowledge and some industry experience. I showed him more advanced material and coached him through complicated algorithms. He advocated for me to an almost embarrassing degree… circling by my desk when the executives were around, heaping praise in a loud voice. He also apologized to me when I told him my salary. I had a colleague who graduated with a master’s degree in analytics. After she graduated she worked for a year elsewhere before coming to Civis, just like me. I was explicitly told that I was supposed to train this person. We were both given the same offer and both negotiated up to the same starting salary. Acquaintance: The damn spics are ruining this country! Me: What!? I’m Mexican you f$#!# @$$#%^&! Acquaintance: Oh, uh… Sorry, I wasn’t talking about you. Me: Who were you talking about? My dad? My grandfather, the WWII vet? This even happens with people who know I’m Mexican. I am just so Assimilation: Mission Accomplished that they forget. A slip like this happened 3 months into my time at Civis. The CFO was quoted in a “humorous” email thread where he referred to speaking Spanish as “speaking poor”. This is the Chief Financial Officer; the guy who was cutting my checks. I began to suspect that my 4-month interview process took so long because this Goldman Sachs alum was just practicing “great arbitrage”. One distasteful comment and a drawn-out interview process weren’t enough for me to raise a fuss. I grew up in the suburbs navigating conversations like the one above. In true Dunning-Kruger fashion, there were the incompetent coworkers/managers that insisted I was incompetent. I was removed from listservs repeatedly and wasn’t invited to important meetings. I tried to navigate the situations with subtlety. When I wasn’t subtle enough, one of my managers yelled at me, and then followed me into the bathroom and watched me pee before exiting. That was weird. When one of the female engineers raised the issue of gender balance, I pointed out that I was the only under-represented minority in the data science team and that, even with a PhD in machine learning, it took me 6 months to get into the data science (i.e. machine learning engineering) department and I represent only half of one under-represented minority. That was followed by a Co-founder/VP who, like the Twitter executive, said they’d love to hire under-represented minorities but that they couldn’t afford to train people on the job. It took me a bit to figure out why this bothered me, but then it hit me. She was presuming under-represented minorities needed training, just like her colleagues presumed I was incompetent… WHILE I WAS TEACHING THE WHITE PHYSICISTS! After this I had a couple of the awkward salary conversations above and finally figured out that I was subject to a 20% discount (in addition to the 20% progressive politics discount). All of the drama was taking a major toll on my personal life. But Civis wasn’t done with me yet! I was riding in the elevator with my boss casually talking about troubles at the local school council when the CEO’s college roommate decided the trouble was due to me being a “fake Mexican”. My boss laughed. I was again going to let it go, but then the CEO’s college roommate got promoted (read: old boys’ club). I left shortly thereafter. I didn’t file this suit just for the money. There’s little chance that I’ll get enough money to compensate for the stress. When the company I went to after Civis found out about this lawsuit, my manager and the HR department proceeded to gaslight me until I left. But I’m good at my job, the market is hot, and I’m again gainfully employed. Part of the reason I filed this suit is to help bring to light just how bad it can get for under-represented minorities in tech and politics. There are under-represented minorities in tech who don’t pass for being white, whose faces won’t let people forget they are different. If I, a mixed-race Chicagoan (like our President) with the hottest PhD in the tech industry, can’t get a fair shake at the “Obama 2012 Analytics Team”, what chance does a talented Black or Latino candidate with a bachelor’s degree stand at a company that’s not explicitly “progressive”? When you dig into the statistics, while black engineers get hired at a lower rate than Hispanics, once black people do get tech jobs they are paid close to what white engineers make. If you look at the plot below, the same is not true for Hispanics. Gender and race are additive, so if a black female gets a job, she gets paid (6% + 4% =) 10% less than a white male. At Civis my discount was at least 20%. Civis was beating the industry standard! “There’s this big narrative in the women’s movement: 78 cents on the dollar. Everyone knows what that means. It’s less talked about when it comes to race,” said Laura Weidman Powers, co-founder and CEO of Code2040, a non-profit that nurtures black and Hispanic tech talent. 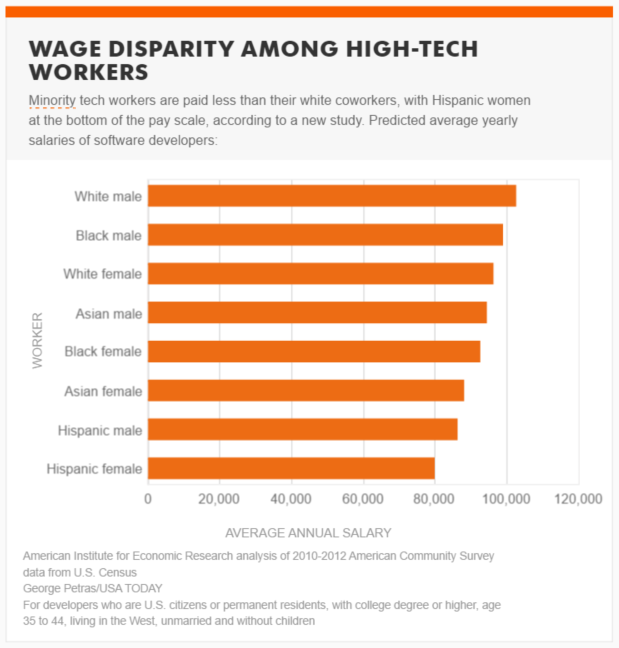 Race and racism is talked about so little in tech that, while the latest O’Reilly Data Science Salary Survey questioned about gender and found a significant pay gap, they forgot to ask about race or ethnicity entirely. It should be noted that O’Reilly Media founder, Tim O’Reilly sits on the board of Civis Analytics (along with the Chairman of Google (Alphabet) Eric Schmidt). It’s even more troubling because there is evidence of bias against women and there is evidence that STEM professionals don’t believe that it exists. The same is likely true for race. One landmark study found that science faculty at research universities rate applicants with male names as more competent, more hireable, and more deserving of a higher starting salary than female applicants, even when the resumes are otherwise identical. male STEM professors were much less likely to believe the evidence of gender bias against women in their own field. Importantly, the researchers’ analysis showed that the cause of this statistical interaction was that male STEM professors were more likely to judge the research harshly, not that female STEM professors were more likely to view it positively. These hypocritical biases seem to be very persistent. Not just in tech, but also in politics. A progressive PR firm just shut down because the guy who was supposed to be promoting progressive causes was simultaneously committing serial sexual assault. His research has found that managers in organizations that promote meritocracy actually show greater bias in favor of men over equally performing women in rewarding merit-based bonuses and promotions. The case filing is here. Update: Somehow I missed that members of the same Obama analytics team were called out for their lack of diversity on the campaign trail. In this context, their quotes to and about me below provide an explanation. Update 2: My follow-up piece on this subject is here. Update 3: I also want to highlight more statistics about racism in the Democratic Party that I would’ve missed (and that Hillary would’ve been unprepared to answer) were it not for Donna Brazile leaking the questions to John Podesta. Thanks Donna! Thanks Wikileaks! … the Democratic Party spent $514 million on consultants, and only 1.7%, or $8.4 million went to minority-owned firms or firms with at least one minority principle. How can the public be assured that either one of you or the Democratic Party can fix income inequality when the same party practices it? They are all so phony. Every time I hear any of the Democratic senators, including my own boss, talk about diversity, I cringe, because it’s all one big lie. That they’ve been allowed to enjoy this reputation as a party that values diversity, while doing next to nothing of substance to align their actions with their words, is expert-level deception. People of color make up over 36 percent of the U.S. population, but only 7.1 percent of top Senate staffers. Latinos make up over 16 percent of the U.S. population, but only 2.1 percent of top Senate staffers. African-Americans make up 13 percent of the U.S. population, but only 0.9 percent of top Senate staffers. Senate offices representing states with large Hispanic and African-American populations hire few senior staffers of color. While those who self-identified as Democrats nationwide were 22 percent African-American and 13 percent Latino, top Democratic U.S. Senate staff as a group is 0.7 percent African-American and 2.0 percent Latino. Despite his background with the Obama campaign, Wagner said neither he nor Civis worked on Hillary Clinton’s presidential bid this year. Not only did they receive over $1m from Priorities USA Action (over $2m from the Democratic establishment in total) in this election cycle, “the primary super PAC supporting Hillary Clinton’s 2016 presidential campaign“, but they also received money directly from Hillary’s campaign, Hillary for America, immediately before my lawsuit in 2015. Eric Schmidt donates to the DNC, the DNC hires Eric Schmidt’s company, when that doesn’t work out then lie about it. This speaks to the veracity of any of Civis’s claims (about my employment there or anything else) and is everything that is wrong with the Democratic party.